Have an event going on this month you want us to include? You may post it in the comments section below. For events in the future, feel free to drop us an email here!! Want to beat the winter blahs? Below are 19 events you can check out this month located in 14 states: Arizona, California, Florida, Kentucky, Illinois, Michigan, Minnesota, Missouri, New York, Ohio, Pennsylvania, Texas, Virginia, and Wisconsin. For more information about any of these events, just click on the red event title and a link to their site will open in a new window. Let us know if you visit any of these hot spots this month! Thumb Area Old Engine & Tractor Assn. Directions/Event Address: Gainesville Civic Center, 311 S. Weaver, California exit on I-35, 2 blocks north. 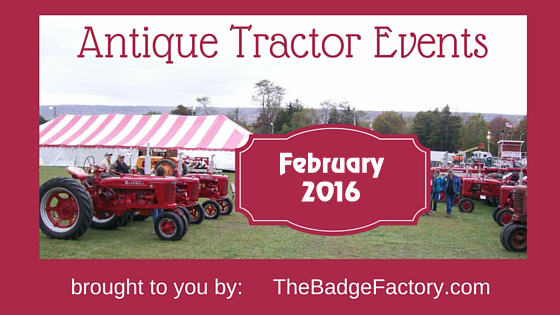 Did you get an antique tractor, or have you finished restoring one? Let us make you a beautiful, weatherproof, custom tractor display sign for your antique farm equipment! Most orders arrive in about 2 weeks, but if you need it sooner our rush order service will get it to you even sooner. Click here to place your order online, or call us today at 410-239-3368! Been looking for a site like this for a long time.